Atlus has some pretty big shoes to fill these days. Over the past decade or so, public opinion of the Final Fantasy franchise (and Square Enix as a whole) as steadily declined. In a time where the JRPG titan can't seem to do anything right, a lot of people are turning to Atlus' Shin Megami Tensei series as the new Messiah. This, combined with a special offer from Nintendo meant Shin Megami Tensei 4 was always going to sell pretty well. However the question is, was Atlus able to perform with all eyes on them? 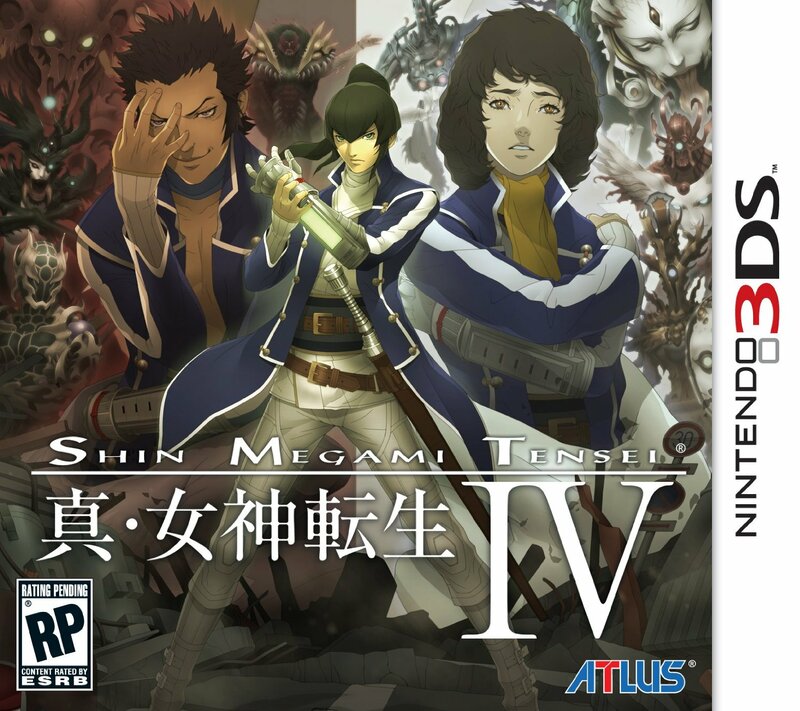 With everyone expecting another legendary masterpiece like Persona 4 (or at least a game to fill the void of good Final Fantasy games) could SMT IV really hit it out of the park? Well, I've played the game for about 25 hours so far, and with that experience I am going to try and answer said question. Now before I get into my actual analysis of the game, I want to talk a little bit about my experience with the franchise so far. I've played a few hours of Persona 3, but never really sat down and played it consistently. I've also played through Devil survivor, parts of which I really liked, other parts of which I really didn't. The reason I mention these things is because when I first played Devil Survivor, I thought things like the demon fusion, the game's difficulty, earning extra turns etc. 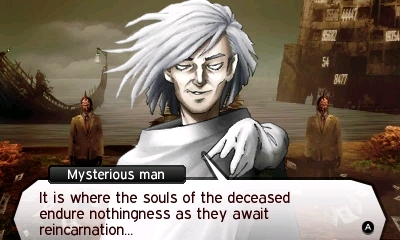 were interesting or unique, when in reality they are staples of the entire Shin Megami Tensei franchise. Well, these things are all present in Shin Megami Tensei IV as well, and my opinion on them has not really changed much. Demon fusion is a pretty awesome mechanic, extra turns are really neat (when you get them), and the difficulty is a giant thorn in my side. So let me talk on the combat/difficulty first, then. SMT games are pretty well known for being hard, and while I don't have a lot of games to compare, SMT IV seems to be no different. Now, I'm all for challenging RPGs, games that require strategy and planning, but there is a very fine line between challenging and frustrating. I would personally say that SMT IV has at least one foot over that line. I think it all comes down to the bonus turn mechanic. Basically, if you hit an enemy's elemental weakness, get a critical hit, etc. you earn a bonus turn, and same goes for the enemies. If you miss, hit an enemy's resistance etc, you lose 2 turns. On one hand, it's super satisfying to assemble a team of ice damage dealers to take out that boss that's weak to ice. You will probably decimate him. On the other hand, if you don't have that team of ice damage dealers, you will probably fail miserably. Heck, if you get unlucky and miss once or twice, you will fail miserably. I personally feel that one of the big differences that makes this mechanic interesting in Devil Survivor but terrible in SMT IV is simply the information given to the player. In Devil Survor, you know before you even engage an enemy what their teams strengths and weaknesses are. In SMT IV this is definitely not the case. The first time you encounter an enemy you can only guess what their elemental properties are, and if you guess wrong the entire flow of battle turns against you. If it's a normal enemy then you can probably manage, though there's a good chance you will suffer enough damage to necessitate heading back to base to heal up. But a single wrong move against a boss will likely spell your doom. The only reliable way to beat bosses is to fight them once, use as many elements against them as you can to determine their weaknesses, then immediately reset and go put together a team to counter said boss. That isn't particularly strategic gameplay to me. There are just so many ways for your group to die that are outside of your control, and they are not limited to boss fights. It almost never feels like a death is because you messed up so much as you got unlucky or the enemy was cheap. Beyond issues with the battle system, the game has plenty of other weaknesses as well. In short: The story moves slower than any other game I can think of. It took ~10 hours for anything of note to happen, many full games aren't even that long. Money is pretty hard to get your hands on, and yet doesn't seem to offer a whole lot besides convenience. I'd rather spend money to summon a demon that I could catch for free than buy a new sword that makes no perceivable difference in battle. You can only have one active quest at a time? Really? Navigating the "world map" is very awkward and usually involves visiting every location to find the one you are actually looking for. Once you leave the starting area, the game barely even tries to direct you any more. Leveling up feels kind of useless, as stat increases don't really make a noticeable difference in battle. The characters are pretty uninteresting and you'r "party members" seem completely superfluous. And that's all that I can honestly think about at the moment. The game is definitely not all bad though. There are a lot of neat little things about it that kept me playing as long as I have. The demon fusion system is as interesting as ever, and I find it pretty enjoyable planning out the ultimate demon team (including reserves to swap in if one dies, or to heal outside of battle). 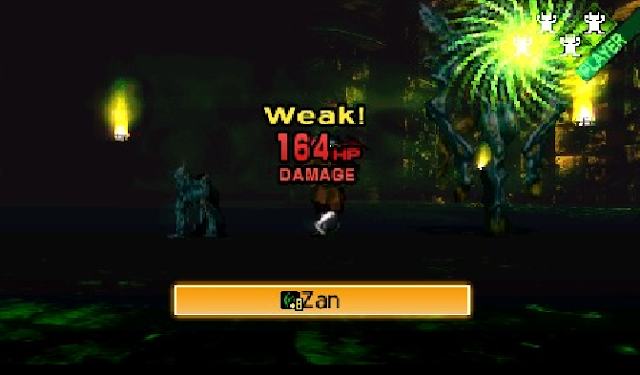 SMT IV also has a system where demons can teach your avatar abilities, but if the avatar already knows the ability in question, it just gets stronger. I find it really satisfying to plan out demon fusions in order to get the most powerful demons, but also give the avatar +8 in the abilities I want. The app system is interesting, allowing the player to choose which bonuses they value most (extra skill slots, more demon reserves, regen mp while walking, convince demons to give you money, etc). Limiting the number of each type of consumable item the player can hold is a great idea in a dungeon crawler game. Any time you die you can return exactly to where you were (although, resetting the game seems to be faster). Furthermore, another interesting part of dieing is that you can pay to be revived with money, or you can use the 3DS' play coins, making SMT IV the first game I have personally seen to actually use play coins (though again, resetting is free). And finally, what little plot I have seen is fairly interesting. 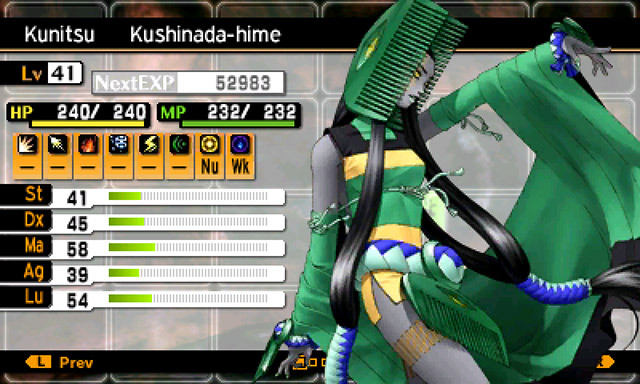 All in all Shin Megami Tensei IV is a game that I want desperately to love, but so far haven't really managed to. There are periods where I have really enjoyed the game, but far more times where I was frustrated or lost or bored. At this point I have essentially stopped playing because I find I'm not particularly interested in wandering about trying to find where I'm supposed to go, dieing horribly, and then spending the next 3 hours grinding. Chances are I would find the game a lot more enjoyable if I were to drop the difficulty down, but the fact remains that "normal" mode doesn't on the whole feel like a particularly enjoyable game to me. I don't want to drop the difficulty because I find it too hard, I want to drop the difficulty because it feels abusive and punishing and unbalanced. But this is assuming I ever go back to it. On that matter, only time will tell.